Home Defenders Mega-Sonic Fox Repeller. Deter foxes from your smallholding, garden or poultry pens with defenders mega-sonic repeller. Boasting two deterrent actions, audio and visual. 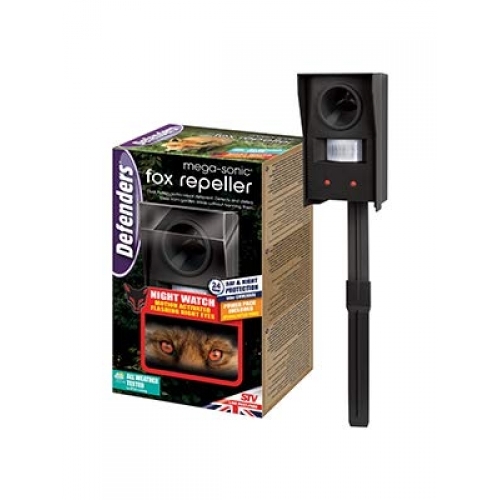 With a flashing red LED eyes and ultrasonic sound repellent, this is a welfare-friendly deterrent to rid your outdoor space of foxes and other mammalian rodents. With its day and night motion sensor, this repellent has a 100m2 detection coverage making it suitable for a range of garden sizes. All weather tested, this durable deterrent is longlasting through all seasons and has a battery or mains-powered option making it adaptable to suit your needs. Mains power pack included 10m range. Fox Snares Heavy Duty (10 Pack). Fox Cage Trap. Heavy Duty.